In a previous series of articles we discussed the capital Apple expends on equipment, real estate, leasehold improvements and data centers. Cost structure analysis reveals subtle shifts in strategy and the CapEx analysis demonstrates Apple’s increasing integration into its supplier network and integration into the distribution and service infrastructure that sustains its ecosystems. 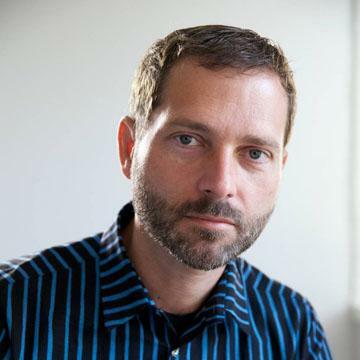 Another form of investing (spending now, reaping benefits later) is the spending on research and development (R&D). 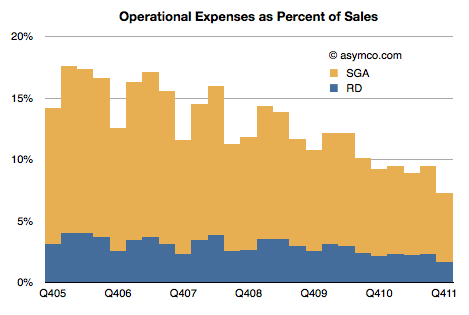 Let’s have a look at Apple’s R&D expenses by quarter since Q1/2006. 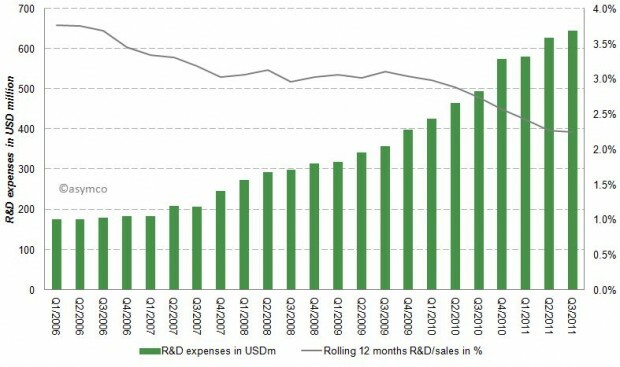 While Apple’s absolute R&D expenses have grown at an annual rate of 33% they have not kept up with the far higher sales growth rate. Apple’s current rate of R&D expenditure is compared to a peer group  below.